Dial Indicator, Continuous Reading, AGD 2 AGD No. Dial Size 2.250 In. Range 0 to 0.200 In. Dial Reading 0-10, Range per Revolution 0.010 In. Long Form Calibration Certificate No, Dial Color White, Bearing Type Jeweled, Back Type Lug, Contact Point Dia. Contact Point Style Ball, Bezel Lock Yes, Features Revolution Counting Hand, Rugged and simple unit construction with a In. Design, Sharp bezel serrations for positive grip, Standards. Zoro has a simple missionWe help small business stay competitive! We do this by offering thousands of great products at super low prices. We're coming for you, Buffaloes. More specifically, they are in California (one in sunny SoCal and one in breezy NorCal), Illinois (the Land of Lincoln), South Carolina (the Land of Mustard BBQ sauce), and Texas (the warehouse there is bigger). Like you, we believe that the key to success is to always put our customers first. 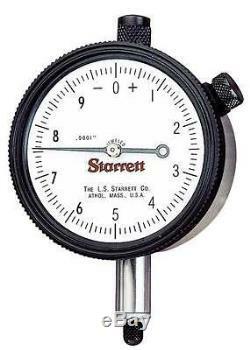 The item "Starrett Dial Indicator, 25-611J" is in sale since Monday, January 23, 2017. This item is in the category "Business & Industrial\Manufacturing & Metalworking\Metalworking Tooling\Inspection & Measurement\Indicators". The seller is "zorotools" and is located in United States. This item can be shipped to United States, Canada, Denmark, Romania, Slovakia, Bulgaria, Czech republic, Finland, Hungary, Latvia, Lithuania, Malta, Estonia, Australia, Greece, Portugal, Cyprus, Slovenia, China, Sweden, South Korea, Indonesia, Taiwan, South africa, Thailand, Belgium, France, Hong Kong, Ireland, Netherlands, Poland, Spain, Italy, Germany, Austria, Mexico, New Zealand, Philippines, Singapore, Switzerland, Norway, Ukraine, Croatia, Malaysia, Chile, Colombia, Costa rica, Panama, Trinidad and tobago, Guatemala, Honduras, Jamaica, Antigua and barbuda, Aruba, Belize, Dominica, Grenada, Saint kitts and nevis, Saint lucia, Montserrat, Turks and caicos islands, Barbados, Bangladesh, Bermuda, Brunei darussalam, Bolivia, Ecuador, Egypt, French guiana, Guernsey, Gibraltar, Guadeloupe, Iceland, Jersey, Cambodia, Cayman islands, Liechtenstein, Sri lanka, Luxembourg, Monaco, Macao, Martinique, Maldives, Nicaragua, Peru, Pakistan, Paraguay, Reunion.